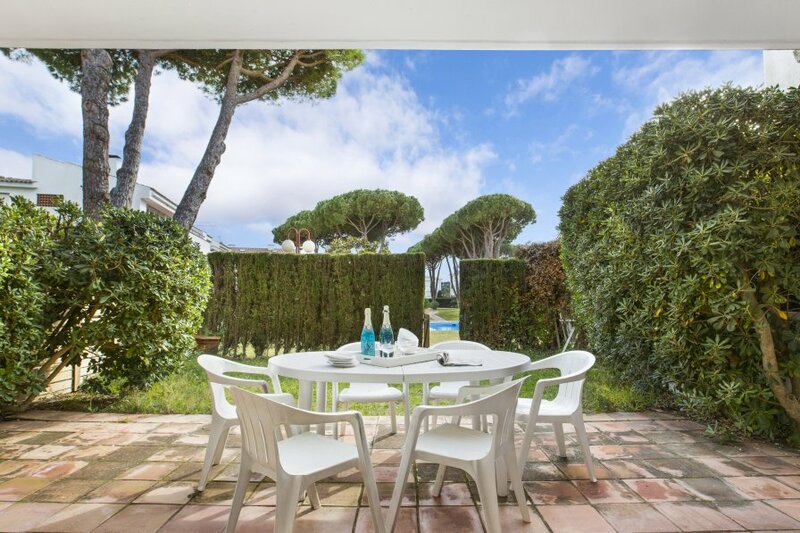 70m2 apartment located in Calella de Palafrugell, 350m from the beach and 450m from the town center. In a familiar community, ground floor with 40 m2 terrace, 2 bedrooms (1 double bed (suite); bunk room), renovated kitchen (microwave, dishwasher), laundry, 2 renovated bathrooms (shower), living dining room (TV, fireplace), terrace. Within a community with pools, gardens and tennis. Calella de Palafrugell is the perfect place to spend your holidays if you are looking for charm, quiet days and wonderful places to discover. If you go there for your holidays you could enjoy, apart from the sandy and nice beaches, about our different good restaurants, little shops, nice views, fun for children... and don't forget to walk around the "Paseo de Ronda", surrounding the sea, a special and wonderful way from Calella de Palafrugell to Llafranc (another little fishernan's village full of charm) that you have to discover if you go there.